Love your creations! Thank you, too, for demonstrating some of the uses for the new corners! Great cards. I especially love the instructions for the background. I have lots of guys in my life! Great cards! So very creative! Thanks for sharing your use of Creative Corners. Great cards, I love the new stamping tools for the Misti! Both cards are fabulous, and great ideas for using your Misti. Love seeing the Creative Corners in use! Both cards are beautiful. Thanks for showing on how you used your MISTI on the cards, very helpful. Such cute cards! Love the repeat stamping. Thanks so much for sharing the techniques using the Misit! Love the Creative Corners. Thanks for showing us some uses for it. Brilliant ideas on both cards. Now I need the creative corners. Beautiful cards Tosha, the one with the tire tracks going on the diagonal is phenomenal!!! 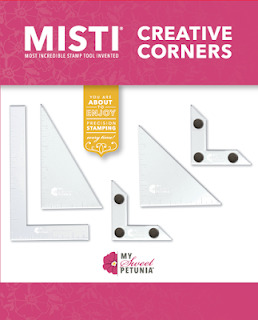 I was wondering about the new MISTI corners but now, you totally answered my questions. omg....have to order that motorcycle stamp...and its on sale!!! bonus!!! 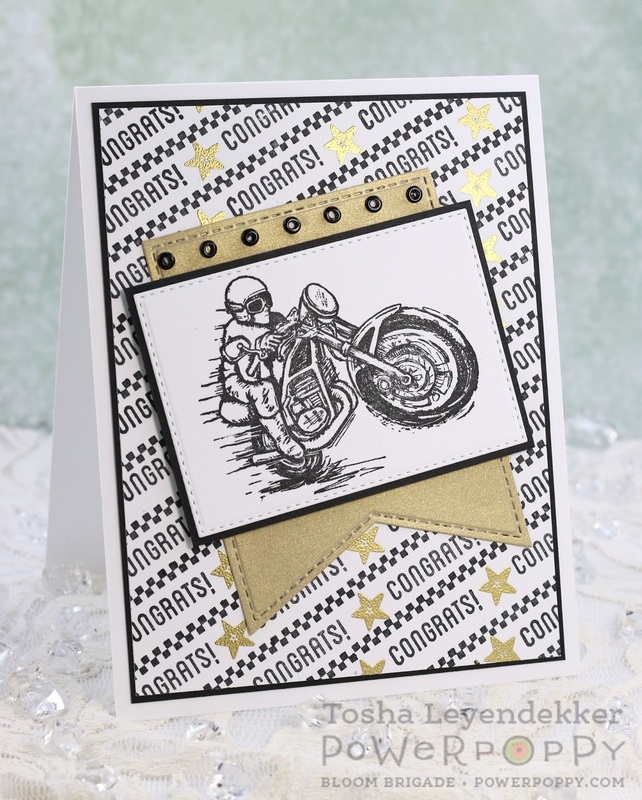 Wow, that motorcycle card is fabulous! Love both companies! Great cards. Thanks for the tutorial. Thanks for sharing and inspiring. OMG that is so clever. Your cards are absolutely fabulous! Love both cards! I really like your diagonal pattern background for the motorcycle. Thanks for the inspiration and for posting the challenge. Great fun! Love how you created the background. wonderful cards, and fantastic tutorial on the diagonals. Thanks Tosh for showing how to use the new corners in more ways than one! Very cool use of the Misti--I'm totally working my way through all these great ideas! (and that lavender sachet is so very sweet. Wow! I've never seen these tips and tools for the misti. Thank you for such an informative post! Makes me want one even more. Nice cards. I especially love the first one. The coloring is beautiful. Thanks for showing how you created these. I LOVE the layering on your lavender card. Great cards. Thanks for showing use of the Misti corners. You (and the Misti) are inspiring me to use sentiment stamps in a whole new way! Thanks for the inspiration! Love how you did the borders! Wonderful cards Tosh. I loved seeing how you used the sentiments with the Misti for some fun placement. 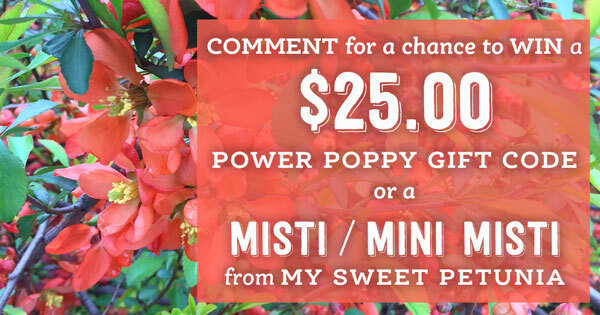 I don't own a Misti yet, so would love to win one. Beautiful Lavender card and fantastic masculine card! Love them both! SWOON!!!! Tosha you have totally blown my mind!!! The sentiment square had me off my chair....the congrats background, delirious on the floor!! Does your creativity know no end!!! YOU.ARE.AMAZING! Great cards! Love the use of the Creative Corners and MISTI, and the stamps you used! Tosh, I love both your cards! Your lavendar bag is ingenious!! I have been wondering about the misti corners for a while, thanks for all the great info!! Great cards! Using the Misti for your cards is so helpful! Fabulous cards! I really must get hold of those Creative Corners!! Love both cards. Amazing stamped background. Lovely card design and great tips, thanks! Love your use of the MISTI tools. Just have to get me some! Great cards. Thanks for the ideas on the creative corners! Both cards are extremely well done Tosha, the Lavender card is so elegant. I am challenged when it comes to masculine cards so I can't tell you how impressed I am with this one! Fantastic work! Adorable cards!! I have the Misti and would love to add some beautiful flower images to my collection!! Great way to use those creative corners. I got mine yesterday and can't wait to use them. Love both of your cards they show the different creative side of you. Thank you for showcasing the corner set. I love what you can do with them. First I need to get my hands on a Misti :) Beautiful cards! Awesome cards Tosha! Love the lavender. for the demonstration for using them. I'll be putting them to use soon. The lavender card is fantastic. FAB cards! I love that lavender one! There is a Lavender Farm right around the corner from me, so I am trying to figure out why I don't own this set as yet? Weird! Beautiful creations! TFS!!! Love your card with the beautiful soft colors! Great ideas for how to use the MISTI! Thanks. lovely projects and good ideas! Thanks for sharing. Amazing tips for the Misti....love your cards! Two lovely cards with some great tips for using the MISTI effectively. Thanks! WOW, what amazing examples.. just love your card, your so creative and thank you so much for all the awesome ideas for using the misti..
Love your cards. Thanks for sharing different uses for the Creative Corners. They have become a must have! Love how you used those corners! Thanks for all the great pictures and details! Great cards and great ideas on how to use those creative corners. Great cards - it's nice to see a masculine one too! The Lavender card is gorgeous. The tan color looks feminine in the lacy border frame. The bag, flower and sentiment makes it so special. Goodness the misti sure is wonderful the square sentiment idea is great makes me think I need the accessory kit now. I really love the lavender card its so pretty, The masculine with the stripes is very clever. 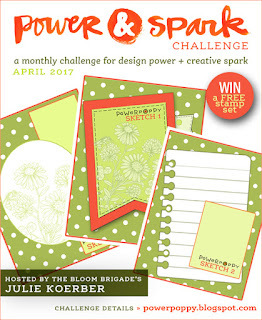 love love love your design...plus I would sooooo love to win either prize! So pick me LOL! the border and pattern you created makes it abundantly clear why the MISTI is so necessary for crafting! Ahhh-mazing cards! Especially loving that Congrats background! Really appreciate you sharing the process too. LOVE LOVE LOVE your cards!!! The Lavender one is so feminine and soft and your second card just blows your mind!! The detail that you went to!!! Stunning and Amazing!!!! Wonderful cards. I love the border you created with words. That is clever how you lined up for that Lavendar card. And I love the coloring on it by the way. Great vintage feel. Great cards. The second was my fave; it is hard to come up with WOW masculine cards! Thanks for the tips on using the MISTI creative corners. Looks like a must have. These are awesome!!! I so NEED a MISIT and apparently, I will also NEED the new corner tools!! Thanks for the tutorials; it makes so much more sense when you can see how something works! LOVE the background on the second and the bag on the first is amazing!! 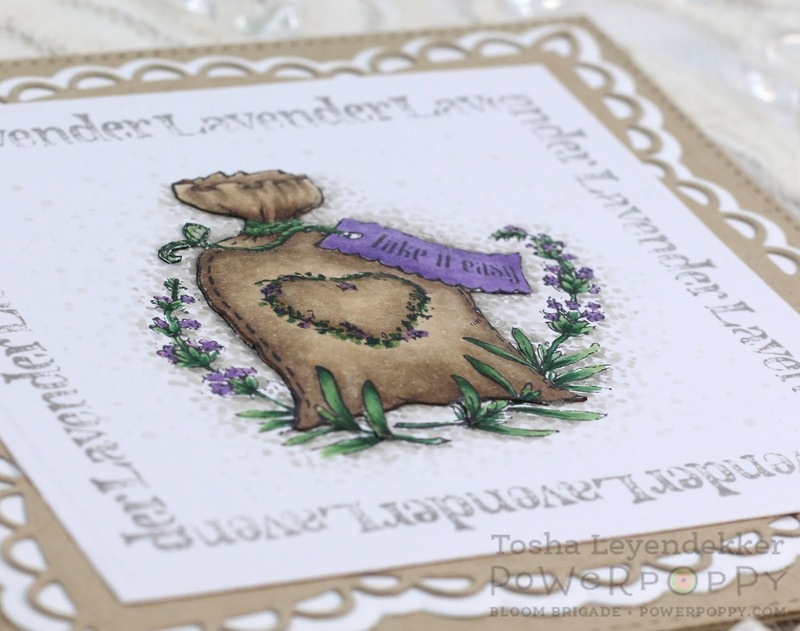 Like the vintage feel of your lavender card. I may have to get that one! I love the lavender sentiment box. Great idea! This is sooo great. Love how ypu used this Misti. Both cards are wonderful. Love this idea for lining up the sentiments in a square, great masculine card too!! I like how you used the Misti to create these great cards. great projects & awesome use if the MISTI! Wow!Wow! Wow! The lavender card is beautiful but I am blown away on your background on the masculine card! Another fantastic method for using the Misti! Thanks a bunch! wow! Awesome use of the Misti to "line up" lines!! Love the cards . .. thanks for inspiring! 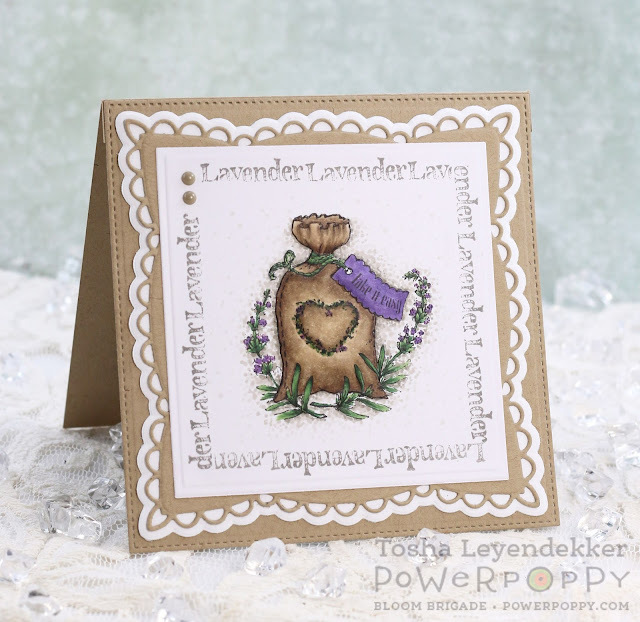 Love this lavender set, and your cards are beautiful! Wonderful cards! Love the sentiment stamped around a square. Thanks for showing how to use the corners & triangle with the Misti. They are on my list right at the top. I just love both of these cards. I love how you used the corner tools. I love how you made the background on the masculine card. I'll be wanting to try that. Thank you for sharing. Great tips for using the Corners, your cards look fab! Wonderful cards. 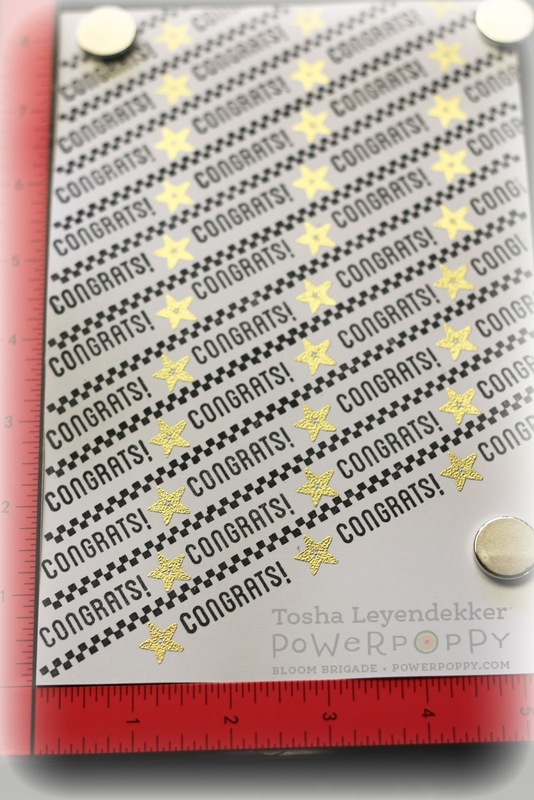 Your stamping techniques with the misti are awesome especially that congrats background - amazing. Wow, your masculine card would fit my hubby's criteria like few cards do: no lace, ribbon, buttons, bows, hearts, flowers or gems! Way to go! Wonderful cards, love how you did the background on the guy card. Really inspiring. Thank you, Tosha, for your wonderful inspiration. Can't really see me making that without a MISTI. But I do see myself using parts of this in the future. And I love the frame you stamped...livery cool! The first card literally brought a smile to my face!!! So sweet! 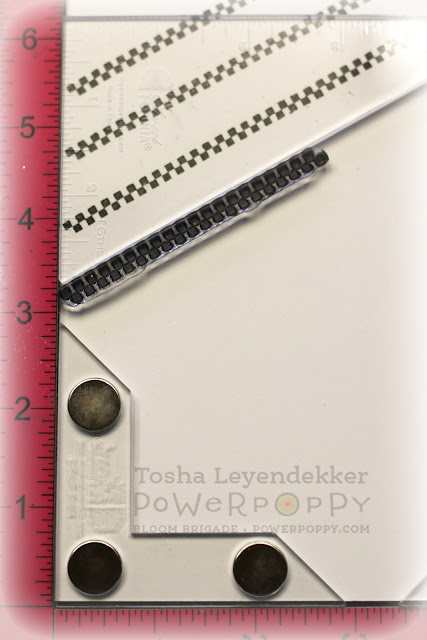 I have been looking at the new accessories for the MISTI, but have not gotten them yet. I appreciate the great info you have given. Thanks for all you do. 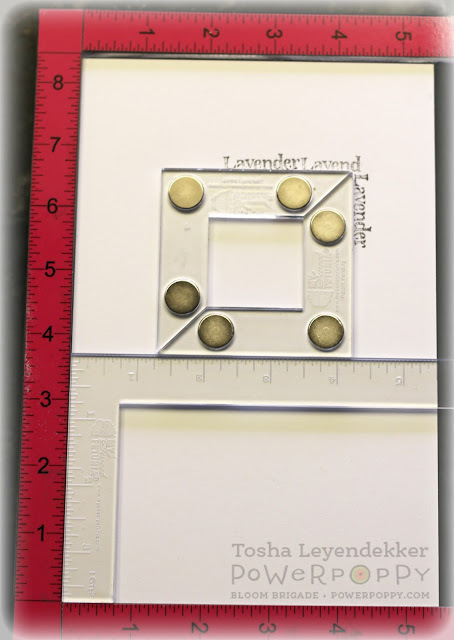 I love the way you could use the Misti and its corners to stamp the square sentiment and the angeled background. Thanks for the ideas. Great, no awesome cards by the way. Love how used the frame in the first card with the lavender bag. The masculine card is really cool as well. Great cards! Thanks for the Misti tips! Nice cards. I have to get the creative corners now... Thanks for sharing. Great example of how to use the new Misti tools! Love your cards! Love your coloring! Thank you for sharing! Great cards! I especially like the Congratulations card. The Misti really helped make that stunning. Great cards. Love the kind of rustic look of the first one. Love the cards and technique with lettering! Thanks for the tips on the MISTI Creative Corners. I just got mine, but I haven't had a chance to use them yet! Great cards and I love how you used the creative corners for the MISIT! Great cards. Like the craft border. That first card is very cute and I like how you created that second background. Seems so easy with the Misti and creative corners! Beautiful cards! I love how you've stamped the "lavender" in the first card. The background is fabulous in the second card. Love your card. So pretty. 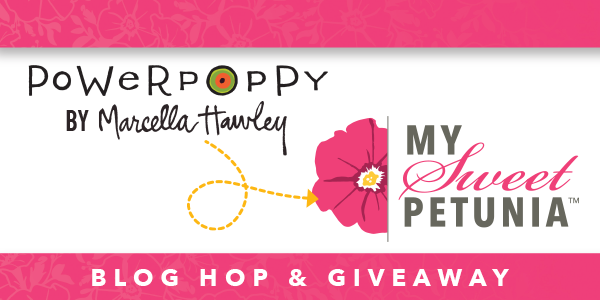 Would love to win a certificate to Power Poppy. Love my MISTI! thanks for more great ideas! I've always had trouble angling repeated backgrounds. I can see how this would help! Love the pretty lavender card!! I love, Love, LOVE the motorcycle card so much that I want to buy it now! That MISTI sure would come in handy to work with it. Thanks so much for showing how you did it all! Very cool use for backgrounds! Great cards, Tosha! Thanks so much for the tips on the MISTI tools, and for participating in this great hop and giveaway.